You may have missed it but this weekend is the inaugural Tunbridge Wells Beer Weekend where numerous of our beery venues around Tunbridge Wells are hosting tap takeovers, beer talks, meet the brewers, quizzes and brewery open days to celebrate those finest of hoppy beverages, BEER! 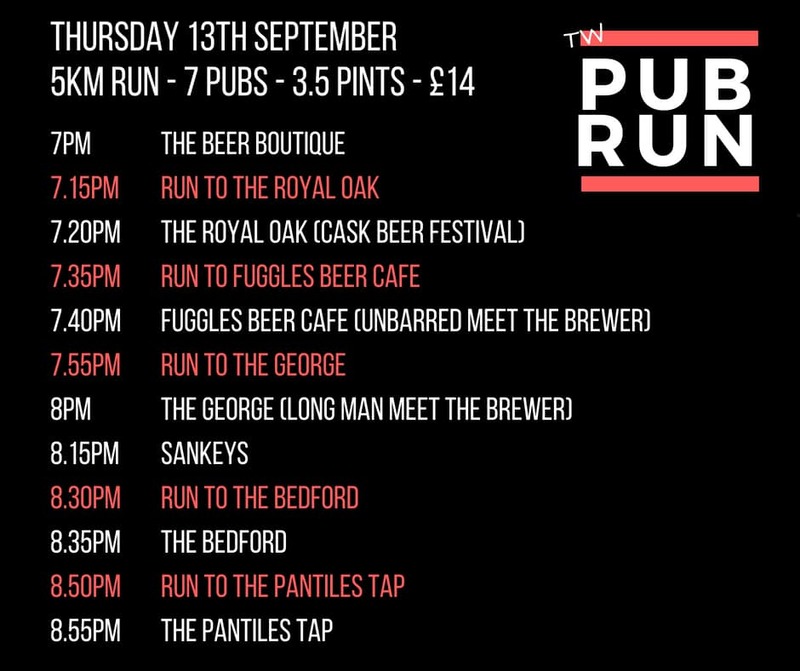 To kick off proceedings, yours truly is leading a 5km run stopping at 7 of the participating venues along the way where, for your £14 drinking fee, you’ll receive a half pint of finely crafted beer in each. This is a social run and all abilities welcome so if you’re not attending Yoga and fancy an alternative ‘workout’, we leave The Beer Boutique (40 Mount Pleasant) at 7pm. See attached for schedule. One of the confirmed runners is also conducting some research on behalf of Asics. He’s keen to chat to runners informally about trainer choice and running motivation. If you are unable to attend the run due to Yoga and there for share your experience but can still help out with some research, we will be hitting the Pantiles Tap at approx 9pm and would love to see you there.